Alphabet's profit margins are declining, but Google is still a moneymaking machine. Alphabet's (NASDAQ:GOOG) (NASDAQ:GOOGL) operating profit margin has been moving in the wrong direction over the past several years, a potential cause for concern among investors in the company. Make no mistake, though: Google is as profitable as ever, and the overall profitability picture for Alphabet still looks pretty good. The company formerly known as Google changed its name and corporate structure last year. Alphabet is a combination of two main segments: Google and "other bets." Google doesn't need much introduction, as the online advertising juggernaut features tremendously popular services and applications such as Google Search, Android, and YouTube, among many others. The other-bets division is more obscure, including a collection of projects and businesses in highly innovative areas such as self-driving cars, Nest, Fiber, Calico, and Verily. When looking at Alphabet as a whole, profitability levels remain high, but they're under pressure. 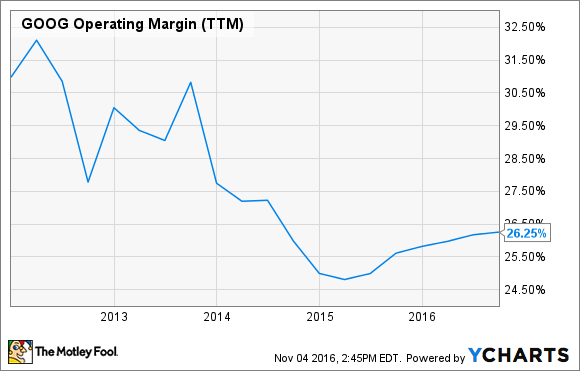 The following chart illustrates the decline in the company's operating margin over the past five years, and the trend doesn't look particularly encouraging. It's interesting to note that GAAP and non-GAAP operating margin, which excludes stock-based compensation expenses, are notoriously different for Alphabet. During the the third quarter of 2016, the company produced a GAAP operating margin around 26% of revenue, while non-GAAP operating margin was a much higher 34%. Stock-based compensation is a crucial metric that needs to be included in profitability analysis. On the other hand, it's a non-cash expense item, and it fluctuates considerably from quarter to quarter. Stock-based compensation amounted to $1.9 billion last quarter, up 30% year over year and increasing by 24% versus the second quarter of 2016. Even if stock-based compensation can't be ignored, investors may want to keep in mind how this remarkably singular item can distort operating profitability figures in a particular period. Even more important, profitability levels for Google and other bets are completely dissimilar, and the difference can have a remarkably significant impact. The other-bets division produced $197 million in revenue last quarter and generated an operating loss of $865 million, so the division is considerably dragging on overall company-level profitability. Management believes that investors should analyze the other-bets segment from a long-term perspective, as opposed to focusing too much on quarterly figures. Other bets are mostly early-stage projects, and they also represent an aggregation of businesses operating in different industries. In addition, performance in a particular quarter can be materially affected by one-time items, such as new partnership deals. Still, the point remains that the segment is taking a big toll on the company's margins. As for Google in isolation, the business produced $22.25 billion in revenue and $6.78 billion in operating income last quarter. GAAP operating margin was thus 30% of revenue during the period. Stock-based compensation amounted to $1.6 billion, so operating margin excluding stock-based compensation was an impressive 38%. Even when considering that companies in the industry tend to offer above-average profitability, Google's profit margins are substantially above those of the competition. As reference, Microsoft (NASDAQ:MSFT) reported an operating profit margin of 25% during the quarter ended in September, while Chinese search engine Baidu (NASDAQ:BIDU) produced an operating margin around 16% of sales in the third quarter of 2016. Alphabet is a combination of two segments with remarkably different characteristics. Google is an undisputed leader in online advertising generating tremendous profitability, while other bets is a portfolio of projects with intriguing long-term potential that produce considerable operating losses. Only time will tell what kind of profitability Alphabet can generate from other bets over the coming years. However, if management decides that those investments no longer make sense, it can easily cut back on other-bets spending without hurting Google at all. Doing so would allow Alphabet to increase overall margins to levels more in line with those of Google, generating a big boost to profitability. The only reason Alphabet's operating margins are declining is that the company is investing lots of money in other bets. Google is still a moneymaking machine, so investors in the company don't need to worry much about profitability.